Automakers and policy makers are increasingly voicing their belief that the passenger vehicle of the future will be powered (partially or fully) by electricity. There remains, however, a lack of consensus on the timing and speed of the transition, in large part due to differing opinions on current and future lithium-ion battery costs and performance. The rise of the electric vehicle is also forcing automakers to reconsider their role in the automotive supply chain, for example by bringing more battery expertise in-house. This is counter to one of the big trends over the last 30 years whereby automakers divested their supply chain arms. Removing misconceptions around lithium-ion batteries is becoming more important than ever. 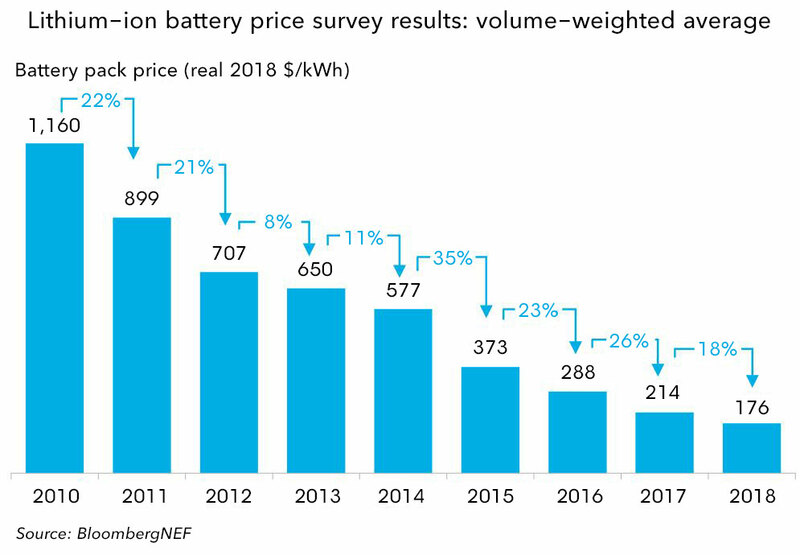 In December 2018, BloombergNEF published the results of its ninth Battery Price Survey, a series that begin in 2012 looking back at data from as early as 2010. 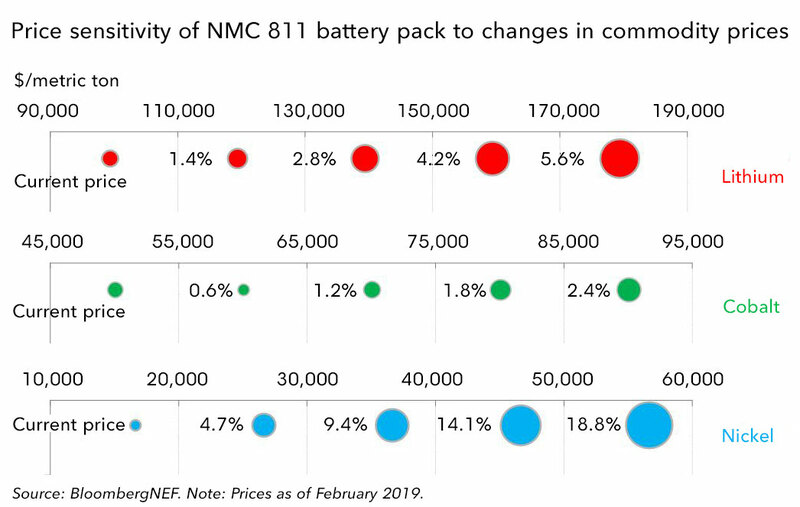 The annual price survey has become an important benchmark in the industry and the fall in prices has been nothing short of remarkable: the volume weighted average battery pack fell 85% from 2010-18, reaching an average of $176/kWh. “Current prices are far lower than this in reality.” This is partially true. There are numerous examples of pack prices quoted to us that are lower than the average. There is a wide range of battery types in the market and anecdotes do not make a market. Many of these, such as Tesla’s publicly stated prices, actually feed into our average. These are then weighted based on the volumes sold. The inclusion of Tesla’s pricing has an important impact due to the large volumes the company has shipped. Other companies may have lower prices but less impact on the average due to lower volumes. In other cases, people are incorrectly comparing cell and pack costs. Overall, we receive feedback that our stated number is both too low and too high and this gives me some confidence that it reflects the market reality. It is, after all, an average. We also publish the full range of submissions in the wider report to BNEF clients. “Current prices are far higher than this in reality.” Similar to the above, a familiar comment here is from individuals or companies midway through their own battery procurement process. They often sigh with disbelief as they are unable to secure the prices we’ve disclosed. While unfortunate for them, they do not have the clout of a Volkswagen or Nissan when it comes to negotiations. There are also good reasons why they may face higher prices: Vehicle type, design and the type of cooling will all have a large impact. For example, the requirements of a battery in a heavy-duty vehicle are likely to be quite different to those in a small passenger electric vehicle, even if there are many commonalities between the two. Manufacturers may be willing to pay more for batteries with specific characteristics. The good news is that the overall industry average is falling, which will ultimately benefit them too. “Batteries will fall much faster than you are forecasting.” The key determinant of our forecast is the relationship between price and volume. From the observed historical values, we calculate a learning rate of around 18%. This means that for every doubling of cumulative volume, we observe an 18% reduction in price. 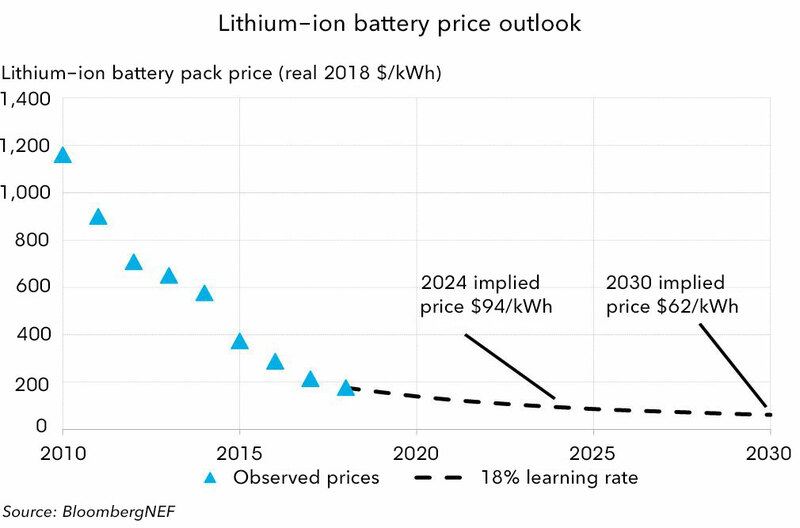 Based on this observation, and our battery demand forecast, we expect the price of an average battery pack to be around $94/kWh by 2024 and $62/kWh by 2030. It’s necessary here to highlight that this is the expected average price. Of course, some companies will undershoot and go to the market with lower prices, sooner. Others will be higher. Different cell and pack designs, a range of cathode chemistries on offer, economies of scale and regional differences will ensure there is a range in the market. A key downward driver of even lower average prices could be greater than forecast volumes. This is crucial and at BloombergNEF, we’re constantly assessing the market for new and meaningful demand segments. Look out for e-trucks in our 2019 Electric Vehicle Outlook due in May. 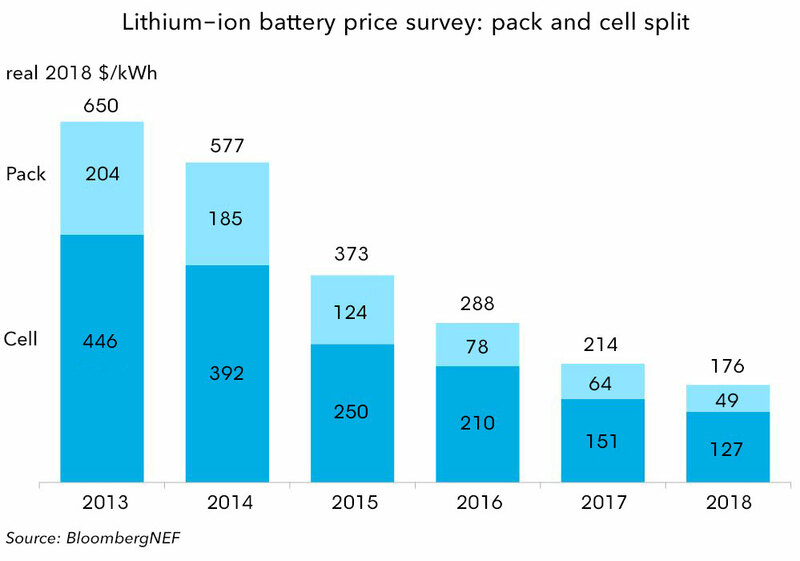 “Battery prices are increasing, not falling.” The two main arguments that battery prices will increase are based on sensitivity to underlying metal prices, and the desire of battery manufacturers to increase their margins. Let’s tackle metals first. Depending on the chemistry, lithium-ion batteries are sensitive to lithium, nickel, cobalt and aluminum prices. BloombergNEF’s Battery Price Sensitivity tool allows our clients to assess the sensitivity based on weekly changes to underlying commodity price across a range of battery chemistries. The sensitivity of battery pack prices to commodity prices is much lower than commonly understood. A 50% increase in lithium prices would for instance increase the battery pack price of a nickel-manganese-cobalt (NMC) 811 battery by less than 4%. Similarly, a doubling of cobalt prices would result in a 3% increase in the overall pack price. Yes, contracts may fluctuate depending on the underlying commodity price but not by as much as you might think. The second argument has more recently come from a number of battery manufacturers themselves. Due to a lack of transparency around margins, in the Battery Price Survey we currently use price as a proxy for cost. This will not necessarily always remain the case as manufacturers adjust their margins and as we gain more visibility. If news reports in Korea are to be believed, Samsung SDI and LG Chem are in talks with a number of their automotive customers to increase battery price contracts by around 10% in upcoming supply agreements. Efforts from any single manufacturer to raise prices would appear to ignore the looming competition from competitors. These companies may be trying to defend a price premium that might not be defensible. They may either fail, or succeed and lose market share as a result. A more co-ordinated push across manufacturers to raise prices would by contrast look like cartel behaviour – and is very unlikely with the landscape as it currently stands. The final question that often crops up is “What comes after lithium-ion?” Even as battery manufacturers scramble to increase production and keep pace with rapidly increasing demand, automakers and investors are exploring technologies that could either enhance or displace existing products. Probably the most commonly cited of these is solid-state, although graphene anodes and ultra-fast charging are up there in terms of frequency and excitement of news articles. By ignoring these, we are sometimes accused of falling into the trap of incumbency bias and of having too linear an outlook on technology advancement. Firstly, it is necessary to put timelines on technology adoption. A company statement claiming a breakthrough ‘once funding is secured’ is clearly premature. People should also not underestimate the time it takes for a new technology to be fully commercialised in the auto sector. It has historically taken 4-5 years to develop a new vehicle model. The move to electrification is shortening these timelines, but safely getting below 3 years is really difficult, and that’s after the battery has already been proven on a rigorous test cycle. We don’t expect solid-state batteries to make a meaningful contribution to the global EV market until the late 2020s at the earliest. There is also a legitimate debate about whether or not experience curves inherently capture technological step-changes. Put simply, something that looks like a future breakthrough today might end up simply being another point on the curve, by the time it is developed and engineered into a viable product and brought to market in a decade’s time. The transitions in the automotive industry away from internal combustion engine vehicles and in power markets away from fossil fuels are well underway. Both shifts rely on lithium-ion batteries making further progress on costs, energy density, and cycle life. The battery business is a murky world, with many misconceptions. Seeing through these misconceptions will be key to successfully managing both transitions.